Property Law Review is a peer-reviewed journal exploring important questions of real and personal property with national or international implications. This high calibre journal publishes articles, notes, comments and reviews dealing with fundamental questions in property law, other than in relation to intellectual property. It welcomes multiple perspectives, ranging across analytical, theoretical, empirical and comparative approaches, analysis of recent developments, exploration of issues of policy and proposals for law reform. Property Law Review offers a unique combination of intellectual rigour and commercial relevance to academics researching and teaching the law of property in its many and varied manifestations. It is also of value to commercial litigators and advisors involved in large-scale commercial transactions that can be caught up in litigation arising from the complexity of property law. Paul Babie holds a Personal Chair of Law in the Adelaide Law School of The University of Adelaide and is Associate Dean of Law (International) of the Adelaide Law School and Associate Dean (International) of the Faculty of the Professions. He was elected a Fellow of the Australian Academy of Law in 2017. He holds a BA in sociology from the University of Calgary, a BThSt from Flinders University, a LLB from the University of Alberta, a LLM from the University of Melbourne, and a DPhil in law from the University of Oxford. Following law school he was an Associate with Howard, Mackie (now Borden Ladner Gervais (BLG)) in Calgary, Canada. He is a Barrister and Solicitor of the Court of Queen’s Bench of Alberta (Canada), and an Associate Member of the Law Society of South Australia (of which he is a Member of the Property Law Committee). His primary research interests include private law theory; property theory; and, property law; he has published and spoken extensively in these fields. He is Editor in Chief and South Australia Editor of the Property Law Review (Thomson Reuters) and an Editorial Board Member of the Journal of Law and Religion (Cambridge University Press), the Routledge Research Series in Law and Religion, the Springer Research Series in Law and Religion, and of the Forum on Religion & Ecology (FORE) @ Australia (affiliated with FORE, Yale University (USA). He teaches property law, property theory, law and religion, and Roman law. The latest Part of the Property Law Review includes the following content: “A Law for Modern Times: The Electronic Conveyancing National Law, Forged Mortgages and Immediate Indefeasibility” – Penny Carruthers and Natalie Skead; “‘A Grade Below Them All’: Real Property Interests on the Reservation of the Eastern Band of Cherokee Indians” – Jason Jones; “The Troubled Borderlands of Torrens Indefeasibility: Lessons from Australia and the United States” – Paul Babie and John Orth; Singapore: “Recent Developments: Fiduciary Duties of Resulting Trustees; Joint Tenancies and the Enforcement of Judgment Debts; Developments in the Doctrine of Part Performance” – Kelvin Low; Queensland: “Instalment Contracts and the Unwary Seller – A Case for Reform” – W D Duncan and Sharon Christensen; Western Australia: “Property Law Issues in Western Australia” – Eileen Webb. This issue also includes the following sections: Editorial; General Editor and South Australia Editor – Paul Babie; and Book Review. 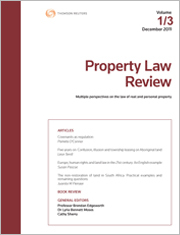 The latest Part of the Property Law Review includes the following content: “Licensee versus trespasser: Hill v Tupper resuscitated” – Oscar S Han; “Regulation and private property: The cautionary tale of Ukraine” – Paul Babie; Consumer Issues: “It’s a new day, it’s a new dawn, it’s a new life … : PEXA, electronic conveyancing, and consumers” – Lynden Griggs; Strata and Community Title: “Tragedy of the anticommons?” – Michael Kleinschmidt; New Zealand: “Are resource consents property? – Ongoing issues” – Thomas Gibbons; Singapore: “Recent developments: Resulting trusts, common intention constructive trusts, proprietary estoppel and equitable accounting” – Kelvin Low; Queensland: “Sharing your home in Queensland: Host, landlord or innkeeper?” – Sharon Christensen and WD Duncan; South Australia: “The meaning of ‘residential tenancy agreement’ in South Australia: Schaffer v Usca” – Paul Babie; Western Australia: “Recent developments: Boarders and lodgers; real estate agents code of conduct; priority between unregistered interests; the Oswal saga” – Eileen Webb.